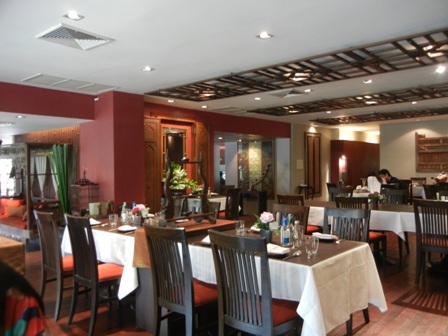 My favourite Thai restaurant in Bangkok is Patara in Thonglor which offers exceptional fine Thai cuisine of greatest quality. I have written about the place a few times, but it is always a very special occasion when the four of us, I mean my family, are heading to Patara for a family experience. 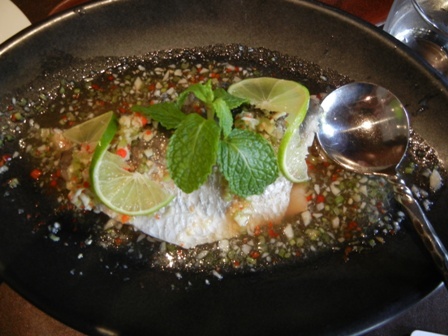 In 2009 Patara was awarded the title: the Best Restaurant in Thailand. We have taken some of our closest friends there to share this experience. The other day, a Sunday, it was time again to patronize the place, and indulge in fine Thai cuisine. And look what we ordered. 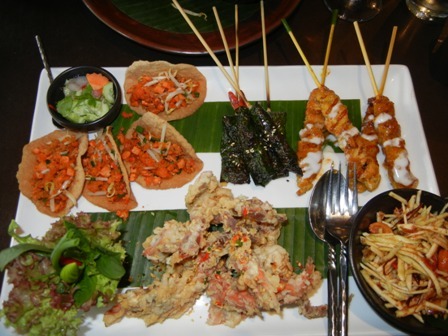 The starter platter is just a wonderful assortment of various delicious Thai dishes. 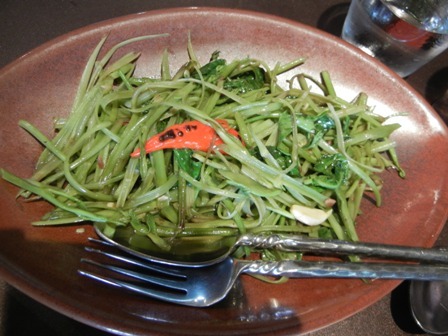 Also the main dishes are fabulous. 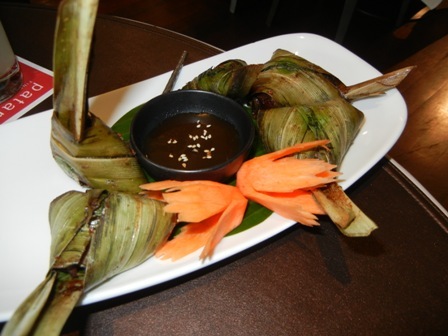 I love the steamed fish with herbs, but also the omelet Thai style, the greens and the steamed rice in four colours. I was pleasantly surprised to find a few Thai wines on the wine list. 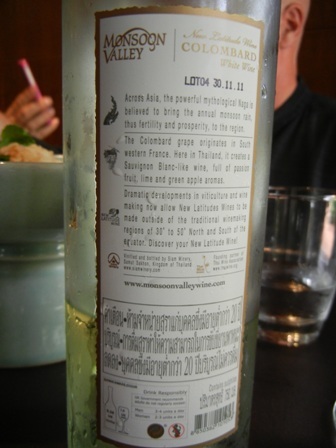 New latitude wines from Thailand are some of my favourite wines since I live here in Bangkok. I choose the ‘2010 Colombard’ from Monsoon Valley Wines in Hua Hin. The winery has a German wine-maker, Kathrin Puff, who graduated from Geisenheim. I met her at the 3rd International Symposium of Tropical Wine in Chiangmai in November last year. I usually do not like the grape variety. 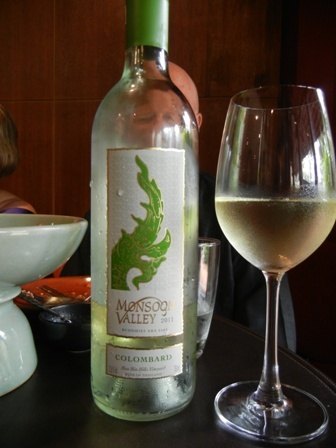 But here in Thailand Colombard makes incredible delicious single varietal wines. It is Monsoon Valley premium range brand. The 2010 vintage won silver and bronze awards. 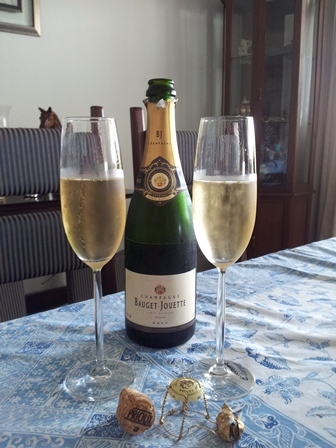 It has a crisp acidity with complex aromas, and a nice finish. Needless to say the wine goes very well with Asian food. I was glad that I had selected it, and was reminded that I need to stock up on the wine myself. Of course we had a coffee after the delicious meal and the desserts. Another highlight is that Patara offers to take you home in their Tuktuk, an open air three-wheeler, which is great fun for old and young. Check it out. It is definitively worth it. I admit, we take all our friends traveling through Bangkok to our favorite Thai restaurant if time permits. 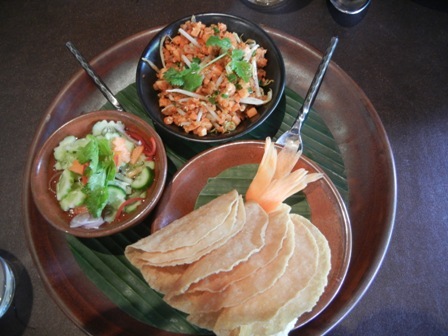 Patara is Thailand’s best restaurant and was awarded the corresponding prize for this achievement in 2009. We just love to dine there. When Timo Mayer and his two daughters came through Bangkok we were pleased to have them for a couple of days and show them around. The Mayers’ came from Germany where Timo was helping with some wine-making in his native village near Stuttgart. He was also selling some of his Australian wine in various places (London for instance). He was loaded with different bottles of very unique wines some of which we tasted together at various occasions. But one evening was reserved for fine Thai cuisine. Patara sent his tucktuck taxi service to pick us up from our home in Thonglor. We decided that we would order the food and Timo would choose the wine. 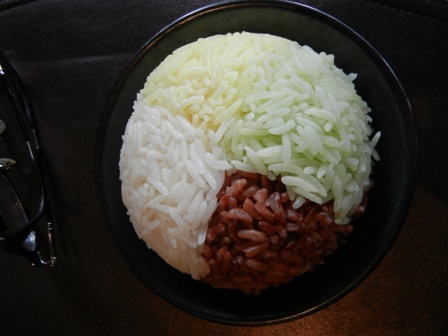 As always we started with the three colorful delicacies shown above. Somehow I had problems taking clear and crisps shots of the food that evening. 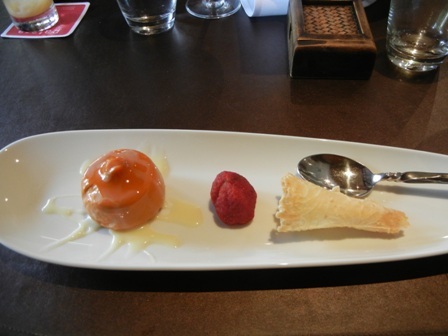 But you can look up earlier posts in this blog where you can find some more photos of the various Patara signature dishes. Timo selected the ‘2007 “Hugel” Riesling’ the classic wine from Hugel & Fils from Alsace. Jean Hugel, the senior vintner and wine-maker of this pioneer family of wine-making in Alsace was a legend and had passed away only in June this year. I had never tasted their wines before and was very excited about the choice. Hugel and Fils maintain not only a very informative website but also an entertaining blog. I had visited Riquewihr, the picturesque Alsatian village where the winery is located many years ago (actually decades ago). 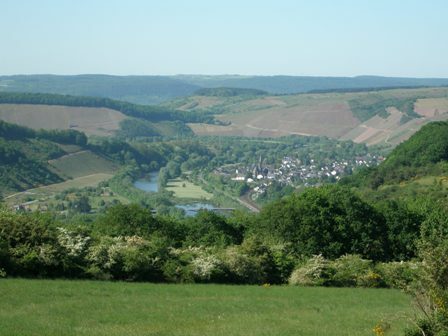 As a high-school student I had visited Alsace and its villages with my school and tasted my first Gewuerztraminer ever. A couple of years later I had seen a play at my “alma mater”: the Bonn University music and arts festival telling the story of the Alsace in three languages. After that my fascination with Alsace was complete. I had the chance to visit several times but mainly the north of the region. 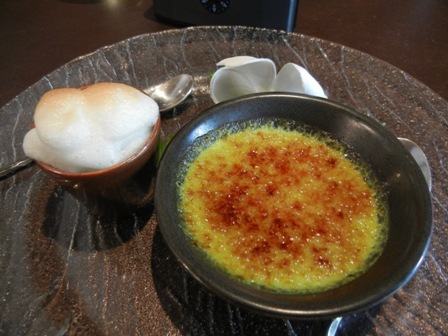 Our favorite destination was a restaurant, Au Cheval Blanc near Wissembourg but this is another story. The ‘2007 “Hugel” Riesling’ is a very fine wine, young and vibrant. 2007 was a good vintage because the grapes had the opportunity to ripen for the longest time ever and therefore the grapes were very healthy. As a consequence the wines show great elegance and balance. The wine is fruity with mineral notes, a typical Alsatian Riesling with the characteristic petrol note. I love Riesling with Thai food. Our evening was great fun. 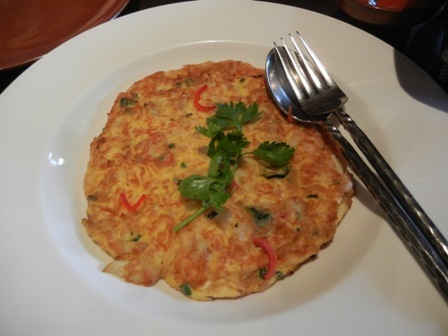 The culinary delights of Thailand are just “breathtaking” for the palate. I can only highly recommend the restaurant. I love the atmosphere and the professional and friendly service. We talked a lot about Timo’s German visit, his impressions, the adventures and, of course, wine. But when friends from afar visit, time flies. That’s how it was. Hours shrink to seconds and in a blimp of the eye it’s gone.